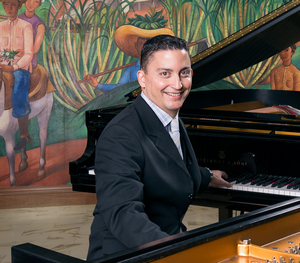 Martin Bejerano, a native of Miami, Florida, has been active as a professional musician since the age of fifteen, when he began his performance career playing George Gershwin’s "Rhapsody in Blue" concerto with the Mexican-American Bi-National Symphony. A graduate of the esteemed New World School of the Arts, he received a full scholarship to attend Florida State University, where he studied classical piano with Leonidas Lipovetsky, and jazz piano, composition, and arranging with Bill Peterson, whom he cites as one of his most important influences. He then went on to receive a Master’s degree from the University of Miami, also under full scholarship. During this time, Martin won third place in the nation in the prestigious 1999 Great American Jazz Piano Competition, and was chosen to attend the famed Thelonious Monk Institute Jazz Colony. In the summer of 2000, Bejerano decided a move to New York City was in order to further develop his career. The move turned out to be a good one, and, in less than a year, he was asked to join the quartet of legendary jazz drummer and Grammy award-winning artist Roy Haynes. In 2004, their recording "Fountain of Youth" was nominated for a Grammy award for Best Instrumental Jazz Album--Martin’s first recording on a major label. In January 2002, Martin also joined internationally acclaimed guitarist Russell Malone’s quartet, and continues to tour and record with both these groups. Employing a serious technical command of the piano, a highly modern harmonic and rhythmic concept, and a commitment to lyricism and musicality, Martin has continually garnered critical praise across the world. Having performed with the likes of the Christian McBride Band, Dave Holland, Pat Metheney, Ignacio Berroa, Lonnie Plaxico, Bryan Lynch, Adam Nussbaum, Arturo Sandoval, Mingus Big Band, Marcus Strickland, and even traded choruses with the legendary Chick Corea, one can easily gain a sense of Bejerano’s formidable talent on the keyboard. Martin has performed at most of the major jazz festivals, clubs and concert halls around the world, and is proud to have toured with “Jazz Reach”, a non-profit organization that presents multimedia concerts for school children across the country, educating them on the history of jazz music as an American art form. In 2006, producer and Reservoir record label owner Mark Feldman heard Martin perform at the Kingston Jazz Festival, approached him after the show, and soon after offered to produce Martin’s debut CD as a leader. Recorded and engineered by acclaimed engineer Jim Anderson at Avatar studios in New York City, Martin’s debut CD Evolution/Revolution was released in May 2007 to high critical praise. It quickly shot up to number nine on the Jazz Week Jazz Album Chart, which lists the top 50 jazz albums based on airplay. Martin's career as a solo artist has blossomed with recent performance at Symphony Space, Dizzy's Club Coca Cola, Jazz Gallery, and Festival Miami, as well as having his trio featured on NPR’s nationally syndicated show “Jazz Set with Dee Dee Bridgewater”. Martin was also awarded the prestigious "New Jazz Works" composition and ensemble development grant by Chamber Music America in 2010. Currently, Martin heads the jazz piano department at the University of Miami, teaching jazz piano, improvisation and composition, and continues to perform internationally. He is featured on several recent recordings, including "Evolution/Revolution", and Roy Haynes’s "Roy-alty".